Scholars wishing to access the New World Department collections and/or library holdings must contact the Mayer Center well in advance of a visit. If approval for study is granted, the collection / library will be made available as the staff of the DAM's schedule permits. The Mayer Center Fellow Program of the New World Department at the Denver Art Museum is designed to support scholarly research related to the museum’s collections of Pre-Columbian and Spanish Colonial Art and to provide curatorial experience to art historians. The fellow works half-time with the New World department on research projects related to the permanent collection. 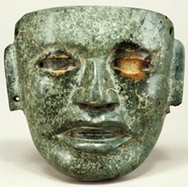 Specific projects will be developed in collaboration with the curator of Pre-Columbian or Spanish Colonial Art. At the end of the research period, the fellow is expected to give a public Mayer Center Fellow Lecture on his or her research on the collection. For information on the fellowship program please email or phone the Mayer Center. The 2018-2019 Mayer Center fellow is Jared Katz. Jared holds his Ph.D. from the Anthropology Department at the University of California, Riverside. His dissertation, Gentle Flutes and Blaring Horns: An Analysis of Ancient Maya Music in Daily and Ceremonial Activities, explores the significance of music in the ancient Maya area. While at the DAM, Jared will be researching the Pre-Columbian instruments in the collection, helping to prepare for the reinstallation of the galleries in the renovated Martin building and assisting with upcoming exhibitions. The 2017-2018 Mayer Center fellow was Sabena Kull, Ph.D. candidate in art history at the University of Delaware. While at the DAM Sabena researched the Spanish Colonial collection, in particular South American paintings in the Freyer collection and embroidered samplers from Latin America and Spain. Her dissertation examines the art and agency of African-descent painters in the seventeenth-century Spanish world. The 2015-2016 Mayer Center fellow was Lucia Henderson, Ph.D. from the University of Texas, Austin. While at the DAM Lucia worked with the Denver Art Museum Maya collection. 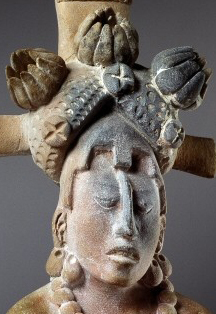 Her dissertation is titled, Bodies Politic, Bodies in Stone: Imagery of the Human and the Divine in the Sculpture of the Late PreClassic Kaminalijuyu, Guatemala. The 2012-2014 Mayer Center fellow was Carrie Dennett, Ph.D. candidate in the Archaeology Department at the University of Calgary. While at the DAM Carrie researched the Pre-Columbian collection, in particular the Mayer collection of Costa Rican art. Carrie earned her Ph.D. in 2016. Her dissertation is titled, The Ceramic Economy of Pre-Columbian Pacific Nicaragua (AD 1-1250). The 2007-2012 Mayer Center fellow was Michael Brown, Ph.D. candidate at the Institute of Fine Arts at New York University. While at the DAM Michael researched the Spanish Colonial collection, in particular the Stapleton Collection of Latin American Art made possible by the Renchard Family. Michael earned his Ph.D. in 2011. His dissertation is titled, Portraiture in New Spain, 1600-1800: Painters, Patrons & Politics in Viceregal Mexico. The 2004-2006 Mayer Center fellow was Laura Brannen, Ph.D. candidate at Emory University. While at the DAM Laura worked on a catalog of the Mayer Costa Rican collection. Her dissertation topic is titled, "Latin American Nationalist Narratives in Transition: Museums of Mexico, Guatemala and Costa Rica." The Mayer Scholarship, established in honor of Frederick and Jan Mayer, is sponsored by Alianza de las Artes Americanas, a support group of the New World Department, and awarded to a doctoral student in early June of odd numbered years for study at the Denver Art Museum the following academic year. It consists of travel expenses, lodging, and a $1,000 stipend, with two weeks of access to the museum's New World collection. The 2017-2018 Mayer Scholarship was awarded to Emily Floyd, Ph.D candidate (Tulane) with Doctoral research focusing on religious prints made in Lima, Peru. The 2015-2016 Mayer Scholarship was awarded to Leslie Todd, Ph.D candidate (University of Florida, Gainesville) with Doctoral research focusing on Ecuadorian creche figures. The 2013-2014 Mayer Scholarship was awarded to two individuals. Roxanne Mamet, Ph.D candidate (Universite Sorbonne Nouvelle) with Doctoral research focusing on the influence of European art on Andean colonial painting. Cara Tremain, Ph.D candidate (University of Calgary) with doctoral research focusing on dress and social identity of the ancient Maya explored through examination of Late Classic period polychrome ceramics. The 2011-2012 Mayer Scholarship recipient was Andrew Hamilton, Ph.D candidate at Harvard University. His doctoral research focuses on "Scale in the Pre-Columbian Andes." While in Denver he examined Andean pre-Columbian objects including the DAM silver Lambayeque beakers. He presented an Alianza lecture titled, "The Dumbarton Oaks Tunic: A Sartorial Statement of Inca Imperial Power," on April 15, 2012. The 2009-2010 Mayer Scholarship recipient was Sara Ryu, Ph.D candidate at Yale University. Her doctoral research focuses on the question of indigenous authorship in the art of New Spain. While in Denver she examined Christ of Ixmiquilpan imagery and cana de maiz (corn paste) sculpture in the collection, as well as conducting research in the library. She presented an Alianza lecture titled, "Technologies of the Making: The Native Artist in Early Colonial Mexico," on Sunday, January 17, 2010. The 2008-2009 Mayer Scholarship recipient was Sonia Ocana Ruiz, Ph.D candidate at the Universidad Nacional Autonoma de Mexico. Her doctoral research focuses on enconchados, mother-of-pearl inlaid paintings. While in Denver she examined enconchado paintings in the collection and conducted research in the library. She presented an Alianza lecture on this topic in the Spring of 2009. The 2007-2008 Mayer Scholarship recipient was Lauren Kilroy, Ph.D. candidate at the University of California - Los Angeles. Her doctoral research focuses on the sacred heart in Spanish colonial art. While in Denver she examined objects in the collection which contain sacred hearts and conduced research in the library. She presented an Alianza lecture on this topic on Wednesday, January 16, 2008. The 2006-2007 Mayer Scholarship recipient was Paula Winn, Ph.D. candidate at Virginia Commonwealth University. Her doctoral research focuses on Ecuadorian stone mortars from the Valdivia and Chorrera cultures. While in Denver she examined the DAM's mortars and conducted research in the library. left, top: Mask. About AD 1-700. Teotihuacán, Mexico. Serpentine. Gift of the Exeter Drilling Company; 1976.58.
left, middle: (detail) Figure pendant. AD 400-900. Colombia or Panama. Gold alloy. Gift of Frederick & Jan Mayer; 1995.848.
left, bottom: (detail) Figurine. AD 600-900. Maya, Campeche coast, Mexico. Earthenware with pigments. Gift of Gisele Charat in honor of Dr. Bach; 1973.184.
right, top: (detail) St. Catherine of Alexandria, Diego de Borgraf. 1656. Puebla, Mexico. Oil on canvas. Collection of Frederick & Jan Mayer; 123.1982.
right, middle: (detail) Casta Painting: De Castizo y India produce Coyote. About 1760. Mexico. Oil on canvas. Collection of Frederick & Jan Mayer; 305.2001.
right, bottom: (detail) Madonna and Child, Pedro de Vargas. 16th c. Peru. Oil on copper. Gift of Robert J. Stroessner; 1991.1194.